Declaration was made through Advertisement No : NPCIL/HRM/ET/2018/03 declaring intent of NPCIL to induct Executive Trainees in Mechanical, Chemical, Electrical, Electronics, Instrumentation and Civil disciplines by short listing candidates based on GATE Scores. NPCIL recruitment department proposes to recruit Executive Trainees in following trades. Applicants who are going to apply this NPCIL Recruitment 2019 will be nominated for Personal Interview on the basis of valid score attained in Graduate Aptitude Test in Engineering (GATE) 2017/2018/2019. Government job applications are invited from Indian Residents for the job profile of Executive Trainee. Eligible & interested candidates are required to apply online on dedicated web portal www.npcilcareers.co.in of NPCIL. Online registration commences on 09.04.2019 (1000 Hrs) and closes on 23.04.2019 (1630 Hrs). 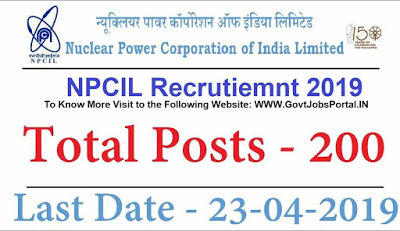 More information explained below related to this NPCIL Recruitment 2019. Those who have passed in the following degrees: “BE/ B.Tech/ B.Sc (Engineering)/ 5-year Integrated M.Tech”with at least 60% aggregate can apply for this NPCIL Recruitment for Executive trainees posts. Must be less than 28 years. 9TH April 2019 is the Start Date to Apply. Application Process: Candidates have to apply online from 9th April 2019 through the official website of NPCIL Department Only. This link for applying online will be remain active till 23rd April 2019. There is no other mode of application for applying. Check IMPORTANT LINK Section Above for online application form and for Advertisement official link. Selection Procedure : The selection of the candidates for this NPCIL Employment Notice will be based on order of merit & Interview.